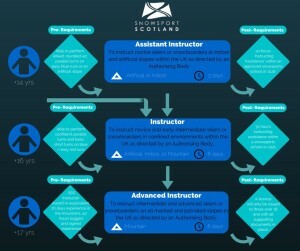 Snowsport Scotland, the organisation in Scotland that represents the interests of Snowsports and supports participation from newcomers to Olympic athletes, has introduced a suite of new Instructing qualifications to support snowsports in Scotland. The new qualifications include 3 levels of UK based Instructor awards, which will be delivered both on skis and on snowboards. The Instructor qualifications start at Assistant Instructor and head up to Advanced Instructor, allowing anyone with an interest in teaching Snowsports in Scotland to take things one step at a time and decide if this is the right direction for them. The Assistant Instructor is for those aged 14 and upwards, takes 3 days to complete and allows candidates to be able to run lessons under supervision on artificial slopes, while giving the candidate a solid grounding in basic instructing theory. The Instructor award allows candidates to teach on the artificial slopes and mountains in the UK, once they have completed the 6-day long course and all post course requirements. 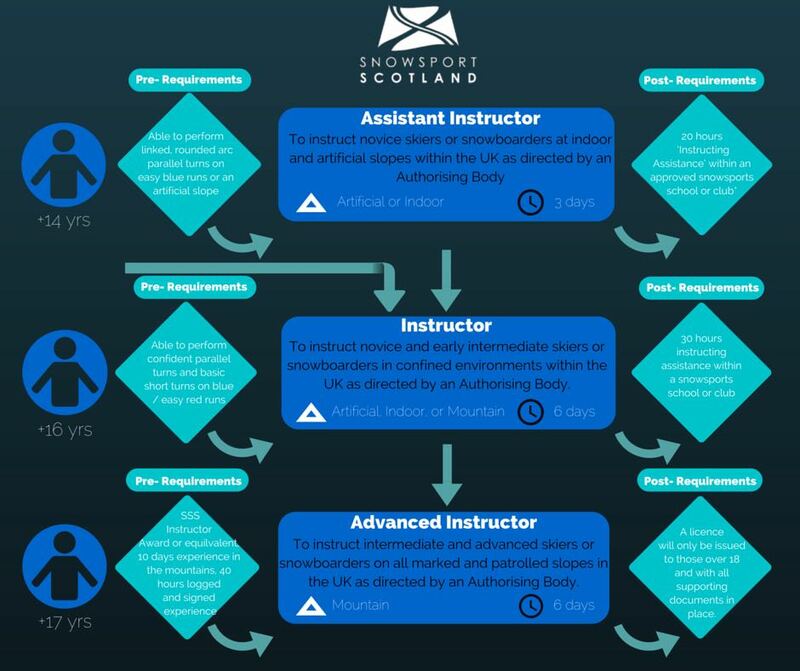 The Advanced Instructor allows candidates to teach a high level of course, thus helping Scottish Snowsports enthusiasts to improve their knowledge and skills easily and in Scotland. 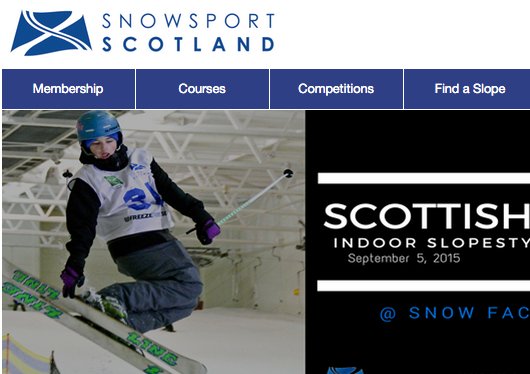 Snowsport Scotland is keen to showcase the many and varied facilities in Scotland through the delivery of these qualifications. The first course of these new qualifications starts on Saturday 31 October at Snow Factor, Braehead over 6 consecutive Saturdays. Jane Campbell Morrison, CEO of Snowsport Scotland finished with; “Snowsport Scotland is a key player in the development of participation in Scotland, and in providing support to athletes on the performance pathway. To help the organisation achieve success in both of these areas, we need to introduce new ideas and new qualifications. These new qualifications will allow us to generate income, which will then be used to not only bring in new people to Snowsports, but also support the athletes on the performance pathway”. Snowsport Scotland Instructor qualifications are designed to train and develop individuals who wish to share their passion and knowledge of snowsports with new or existing participants as part of a UK Snowsports School or other body who oversees the activity. These qualifications are appropriate for instructors who have been directed to work with an individual or a group. They are not designed for, nor are they intended to be used as a validating qualification for independent instructors. The ‘direction to work’ will have been given by an authority (the Authorising Body) which has assumed responsibility for a risk evaluation of the intended instructional session(s) and has deemed that the person being ‘directed to work’ is a responsible and fit person. In doing so the Authorising Body assumes the responsibility for public liability. The term ‘directed to work’ is not related to payment. The normal Authorising Body will be; snowsport schools or clubs, local education authorities*, uniformed groups and outdoor centres. Qualified instructors intending to work with other bodies, such as independent youth groups, should seek advice from the Snowsport Scotland office. * Schools that are outwith the State Education system but are approved by HMIe, Ofsted or ETI are included in this category. Remit: To instruct novice skiers or snowboarders at UK artificial and indoor slopes with indirect, on site supervision as part of a snowsports school or club. Pre-course requirements – 14 years old, able to perform linked, rounded arc parallel turns on an artificial / indoor slope or easy blue runs. Post course requirements – 20 hours ‘Instructing Assistance’ within a snowsports school or club at a UK artificial or indoor slope. Those under 16 can assist lessons under the direct supervision of a currently licenced instructor who: holds the SSS Instructor or Advanced Instructor qualification (or equivalent), or is a member of the ISIA, and is over 18. A licence will not be issued to the instructor is 16 years old and has provided all supporting documents. Remit: To instruct novice and early intermediate skiers or snowboarders in confined environments within the UK as directed by an Authorising Body. A confined enviroment is: an artificial slope, an indoor slope, the defined beginnersarea at the 5 Scottish Mountain resorts. Pre-course requirements – 16 years old, able to perform confident parallel turns and basic short turns on blue / easy red runs. Post course requirements – 30 hours instructing assistance within a snowsports school or club. Those wishing to use the Instructor award in the Scottish Mountain Resorts are required to provide SSS with evidence of environment specific induction training from their Authorising Body, or through Accredited Prior Learning. Upon successful completion of the course, candidates will also be required to complete a 2 day First Aid Course, PVG with Disclosure Scotland, Safeguarding & Protecting Children module and 35 hours snowsport school experience. Once all parts are finished a candidate will be issued with a licence. Remit: To instruct intermediate and advanced skiers or snowboarders on all marked and patrolled slopes in the UK as directed by an Authorising body. School staff and leaders from uniformed groups are entitled to work within the remit of the Instructor and Advanced Instructor awards which they hold when they are responsible for students from their own; school, local education authority or uniformed organisation. The ‘Instructing Assistant’ hours within a snowsports school and environment induction training remain a requirement prior to being issued a licence. The pre-entry requirement for an Advanced Instructor of the logged hours can be achieved with students from their own; school, local education authority or uniformed organisation.